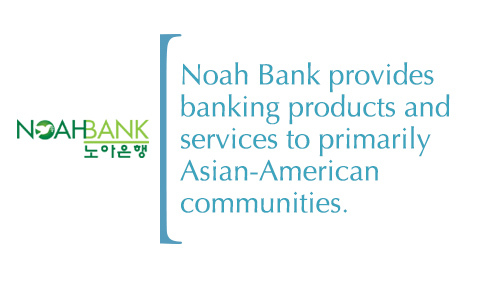 Noah Bank provides banking products and services to primarily Asian-American communities in Southeastern Pennsylvania, Northern New Jersey, and Manhattan and Flushing, New York. Founded in 2010, Noah Bank is an FDIC-insured minority-owned community bank headquarted in Elkins Park, Pennslyvania, with branches and loan offices in New Jersey, New York and Pennsylvania. Noah Bank offers a range of financial products and services to families and businesses, and is a member of the SBA Preferred Lenders Program, Community Development Financial Institutions Program and the Community Development Bankers Association. As a Pennsylvania state-chartered, non-member bank, our primary state regulator is the Commonwealth of Pennsylvania Department of Banking and Securities and our primary federal regulator is the Federal Deposit Insurance Corporation.